Hotel breakfasts are pretty stressful commitments which come at an exorbitant price most of the time – not only are you paying extra for that but you are never sure of finding an empty table or getting all of your favourites… sorry the croissants are over for today! They are even being labeled now as a food waste nightmare! Let’s confess, we pick so many items that we can never finish all of what is on our plate – sad truth! 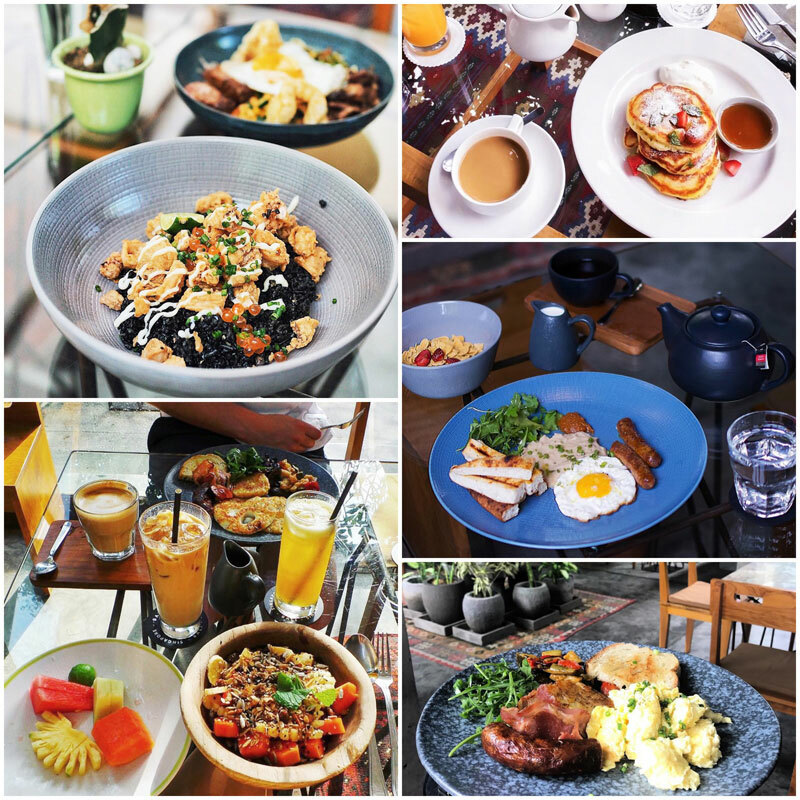 So how about venturing out of your hotel and checking out cafes with heartwarming, delicious and affordable breakfasts? 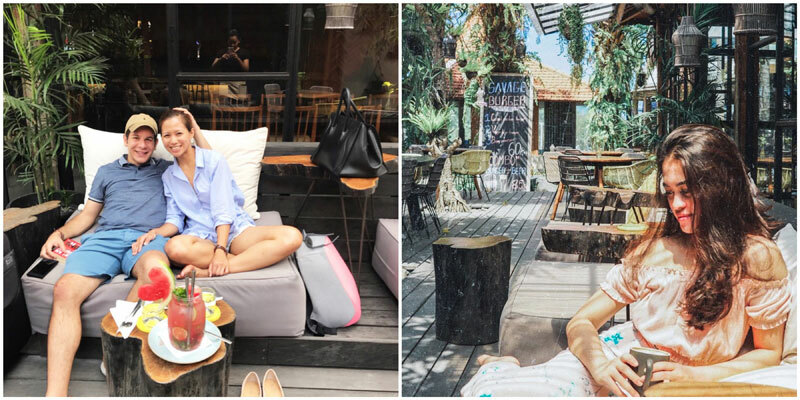 These cafes in and around hotels open early for morning risers, so you can now relax while on vacation without the daily fear of missing breakfast or thinking if some hound has already hoovered up all your breakfast comforts! 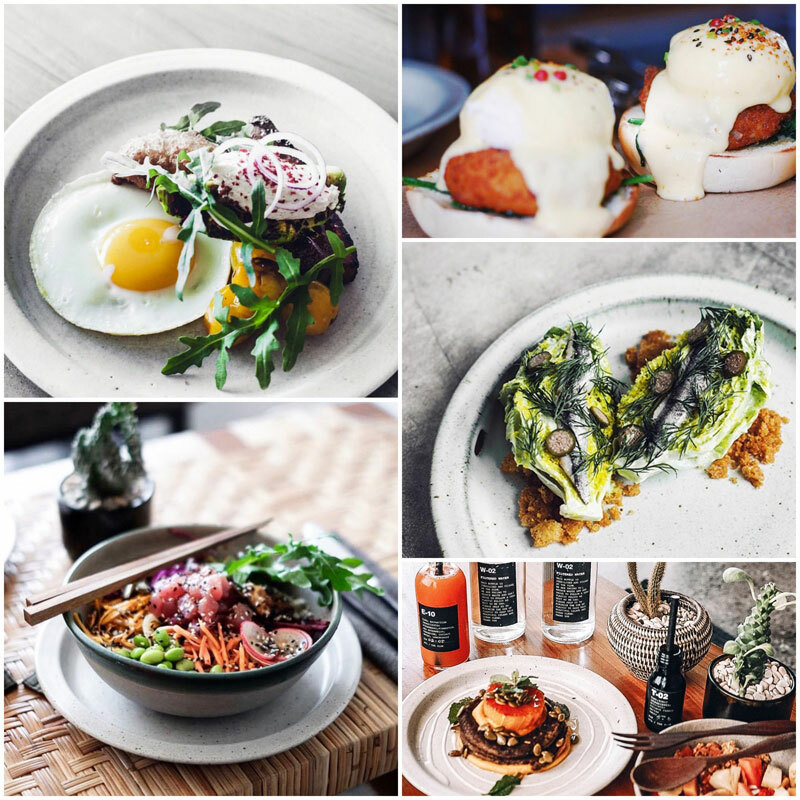 Breakfast didn’t earn its ‘most important meal of the day’ reputation for nothing, especially when you wolf it down at places like Kilo Bali! 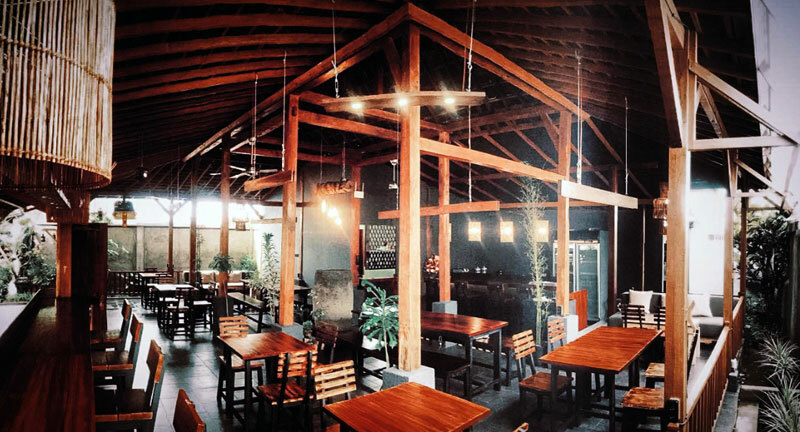 The open-air cafe is distinguished by its unconventional and modern minimalist architecture that challenges the traditional landscape and offers a quiet respite away from all the hustle and bustle. 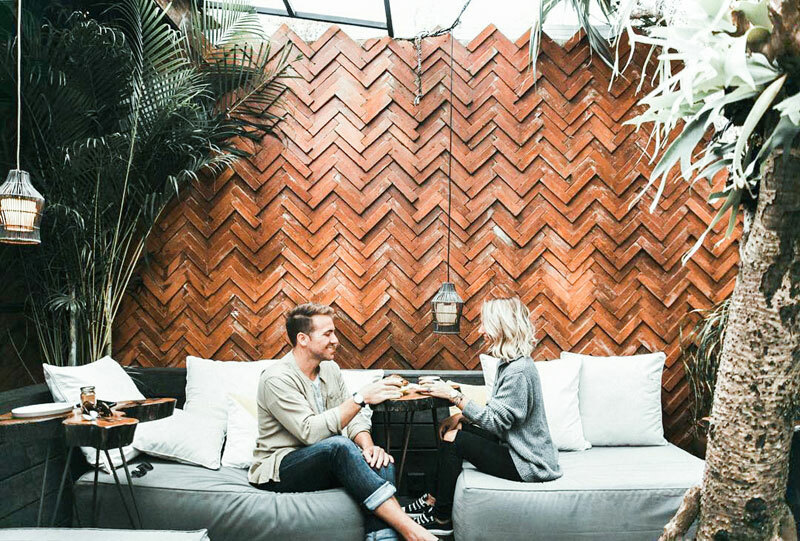 This cafe is never restful during the day (it attracts big crowds for date nights), but it does not mean that their meals are less appealing during day time. 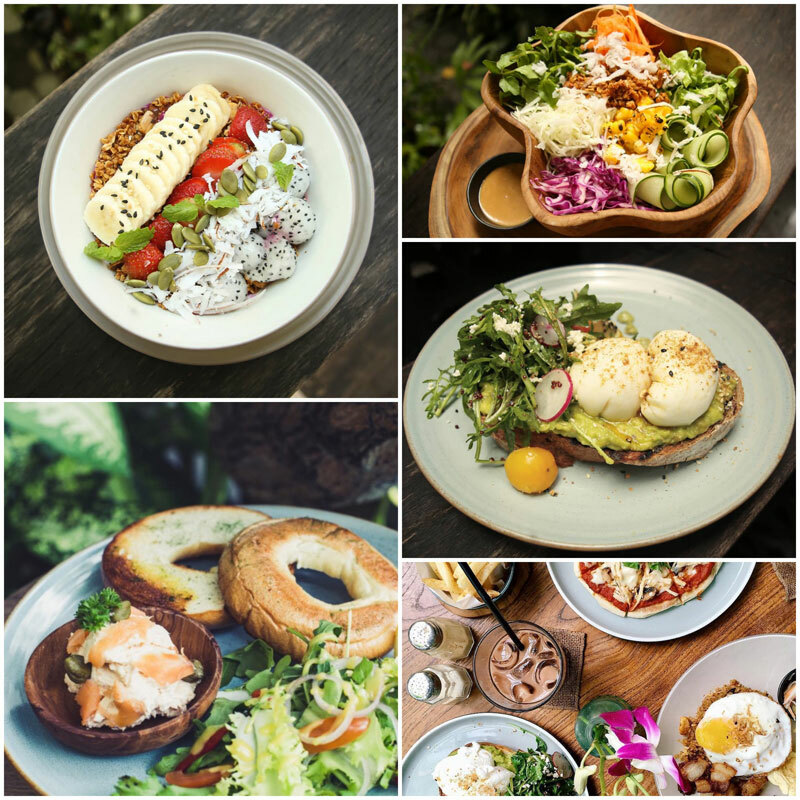 Kilo Bali serves you the good as from 8am with non-traditional breakfast items too – if you are up for some heavy meals prior to your exploration day (that means you can save up and not have lunch too), you should definitely give a go to their Poke Bowls that are packed with goodness like tuna tartare, salmon, eggs and more! And why not a Lamb Taco? Joking! We mean Bacon French Toast, but we would not judge you one bit if you chose their Duck Taco for breakfast too 😉 Don’t miss out on their fresh fruit options that come in different versions – chopped in bowls with granola, squeezed in glasses with ice or whole on platters to share! 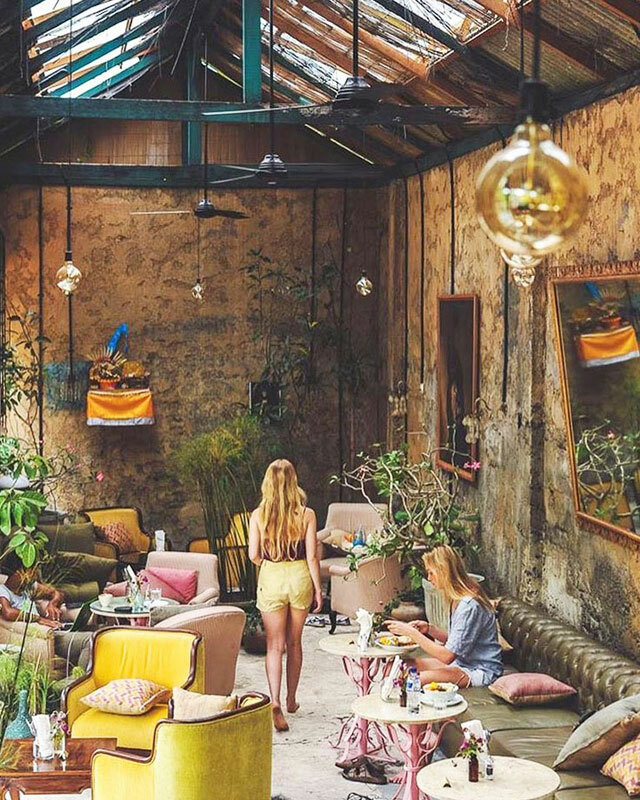 Located in Bali’s coolest neighbourhood, The Slow is a multifaceted island stay incorporating boutique accommodation, all-day dining, drinks, art, local culture, and interactive retail – a place to stay, eat and play (that’s how they call it!). 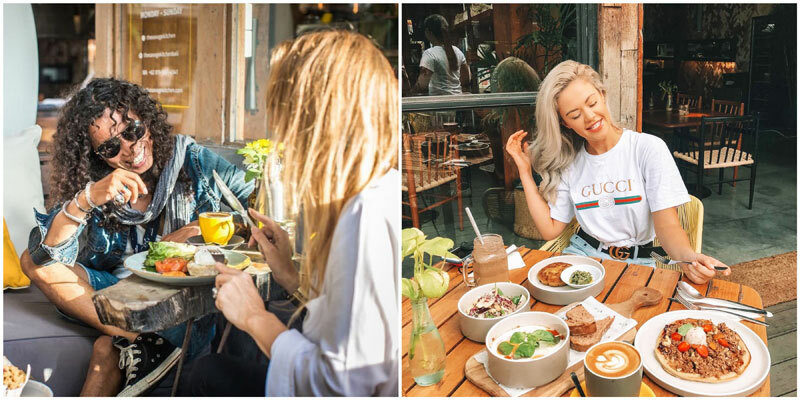 The spot is a post surf, pre yoga joint for some morning eats and helps to recharge with an amazing menu that focuses on wood-grilled meats and seafood, local vegetables, farm greens, and field grains. 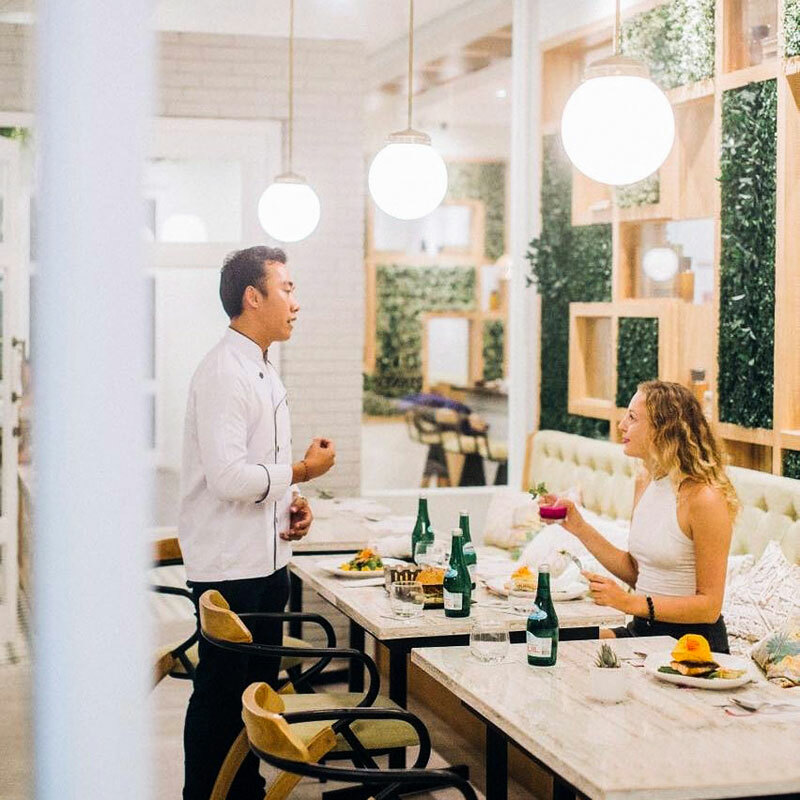 Whether you are staying there for the night or simply dropping by for a quick bite, know that the entire menu at The Slow is based on seasonal produce, with fruits and veggies coming from a co-owned local farm. None of the menu selections are what’s trendy at the moment, they are simple and exactly what you look out for at breakfast time, all sourced locally, packed full of nutrients.The idea at The Slow is to share your dishes (aren’t we always jealous of other orders that often look better, aka food envy?). 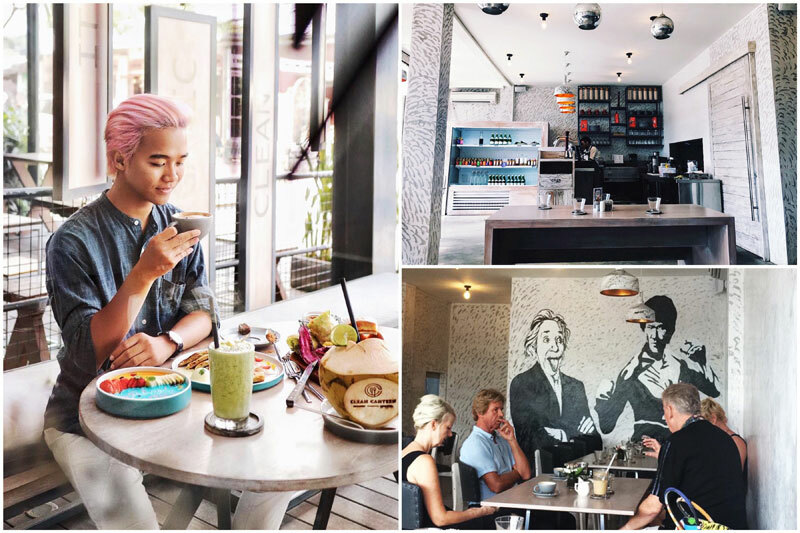 Sit down for an Ancient Grains Porridge – a fruity selection on their menu that combines red rice milk, grapes, java apple, almonds and mint while your travel companion gets hands on their warm Banana and Jackfruit Bread. This morning eat comes with fresh banana, passionfruit ricotta and coffee nectar and is bound to be a wake-up call to all if matched with their Kombucha. 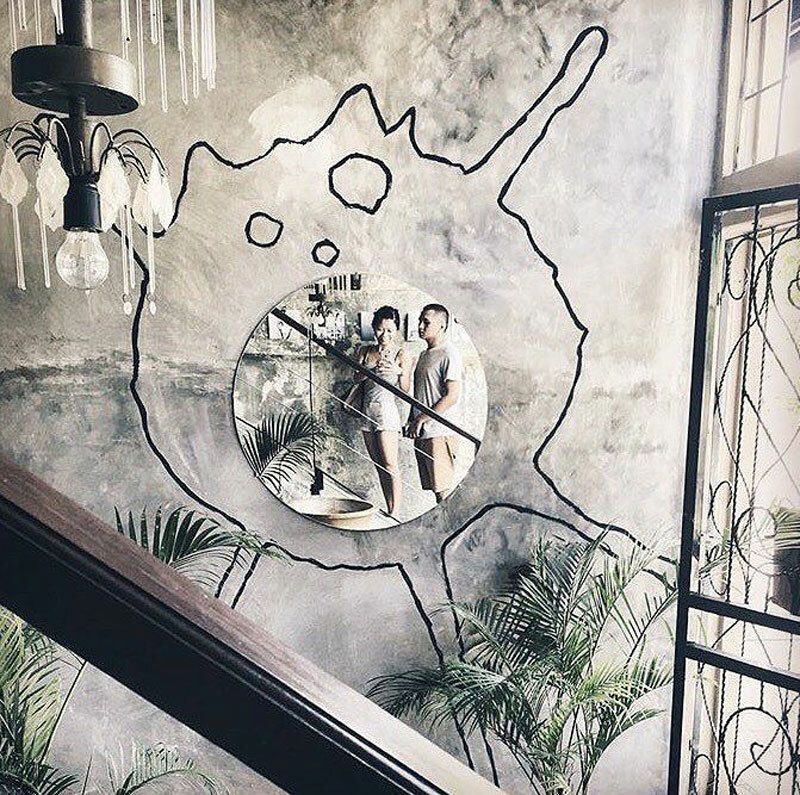 You can’t expect more than perfection when the place is designed and thought by two superstars – husband is a designer and wife is a model who want you to experience a slower pace of life (be it at their accommodation or cafe)! The place boasts in meticulous design along with ultimate beach vibes so you can really see that fashion met laid-back surf culture there. The Slow is filled with one-of-a-kind art pieces and classic collectables scattered all around too, each with its own history and meaning. 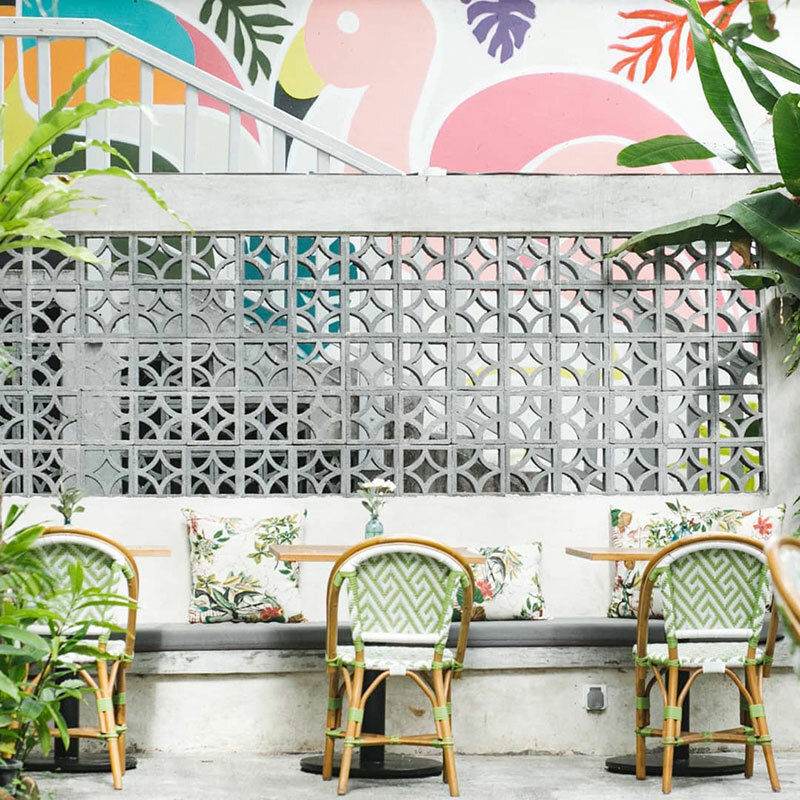 Hopping out of bed is a smidge easier when you’ve got cafes as cute and funky as Neon Palms at your doorstep. 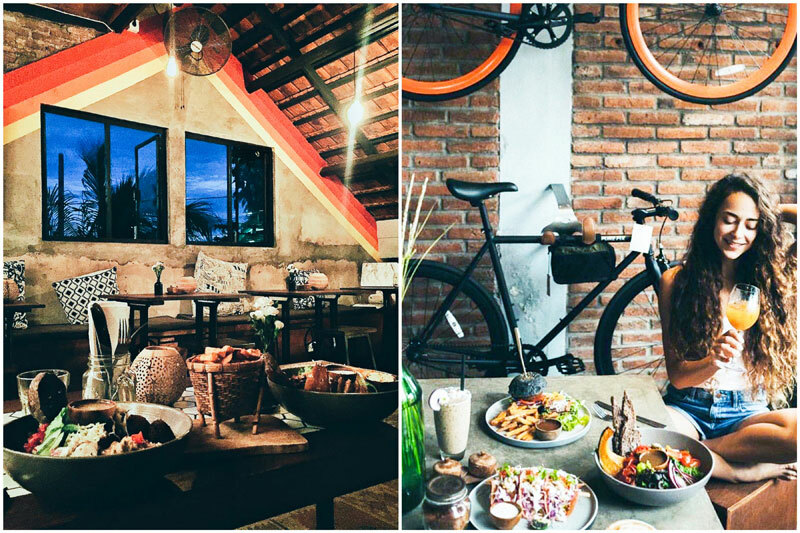 This cafe in Seminyak is located on the second level above the famous Bali Boat Shed clothing store. 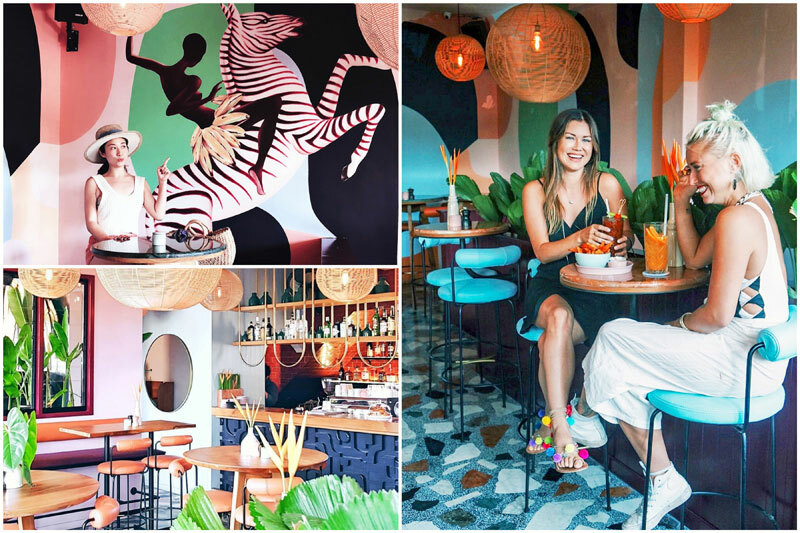 With amazing offbeat interior decor, tropical wall art and outdoor funky look, the little cabana-feels cafe serves breakfast on the daily as early as 8am (P.S. Even their cocktails are available at that time!). 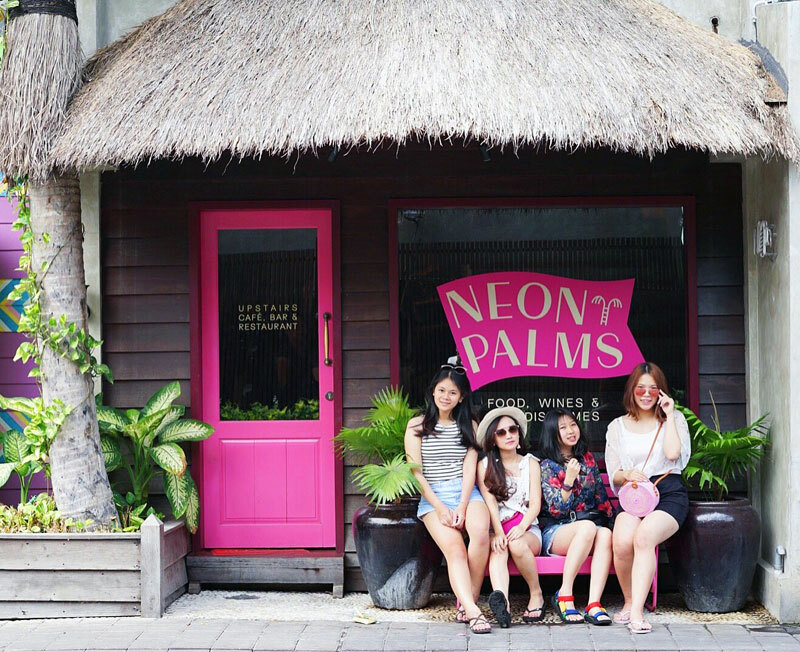 Neon Palms is a sure-fire bet for guaranteed morning good times – there is something very comforting about their breakfast menu that stays straight-shooting. Breakfast lovers simply fall for their Eight Seed Toasts lathered with wild honey or other concoctions. They serve a delightful Mango and Pineapple Chia Jar that does not go unnoticed either but the biggest hit is their Berry Bowl with strawberries, granola and more! Sure, they also have the ever-present avocado on toast, but don’t expect the kitchen to simply “smash” some avo onto crusty bread. Neon Palm’s version is a tad bit more extra – it comes with savoury halloumi, shaved ricotta, tomatoes and dukkah sprinkles (a mixture of ancient Egyptian spices), match this with one of their healthy drinking potions and you are sorted for your most important meal of the day! 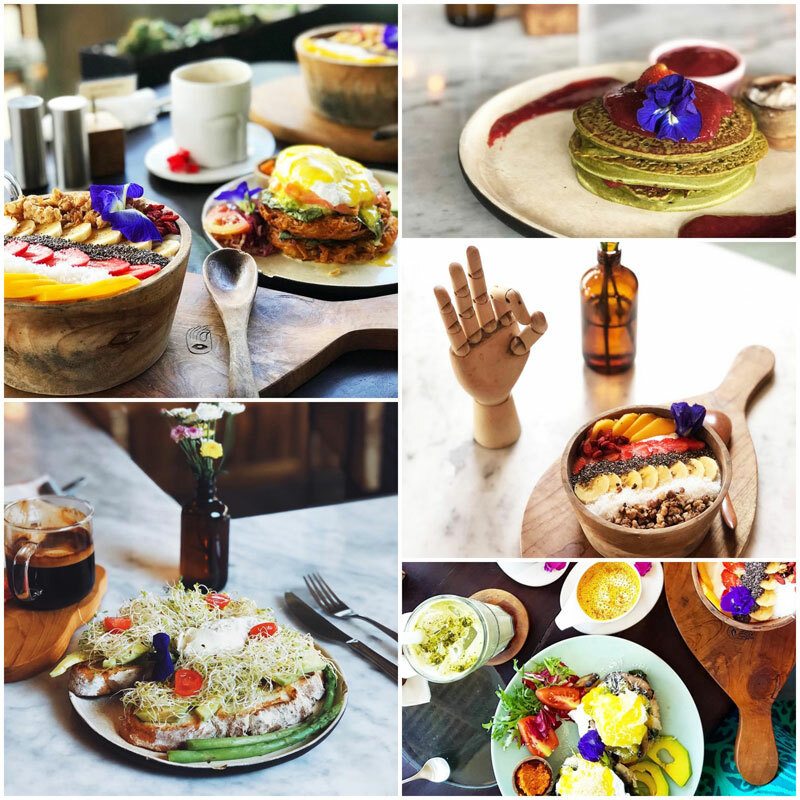 Breakfast fans won’t be disappointed here, and can we all agree that with such amazing interior and even better food, breakfast shots taken at Neon Palms are simply jealousy-inducing? It might be a bit of a challenge finding the cafe, but it’s worth the search! 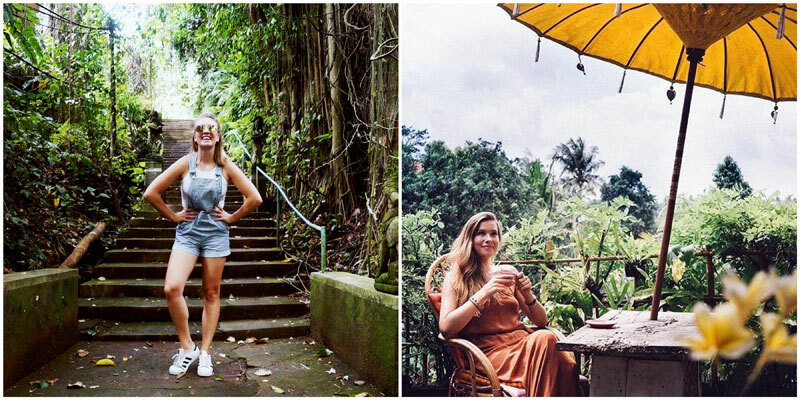 Take a tranquil walk along alleys and rice paddy fields, and follow a steep set of staircase (Penestanan steps) and you will find Yellow Flower Cafe. 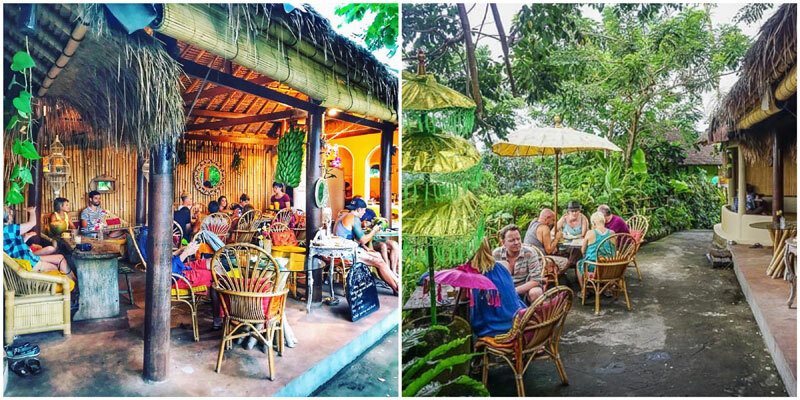 With a limited number of tables, this cave-like cafe in Ubud is what we call a “hidden gem”, one of the lesser-knowns that does not need to be commercialized to be popular. Settle at one of their covered tables or one outside. Or how does rooftop breakfast with a view of Mount Agung on a clear morning sound to you? Your morning sweet tooth calls for the best chocolate smoothie in town, or any other flavour does the same great job with the same great taste (we love the fruity ones)! 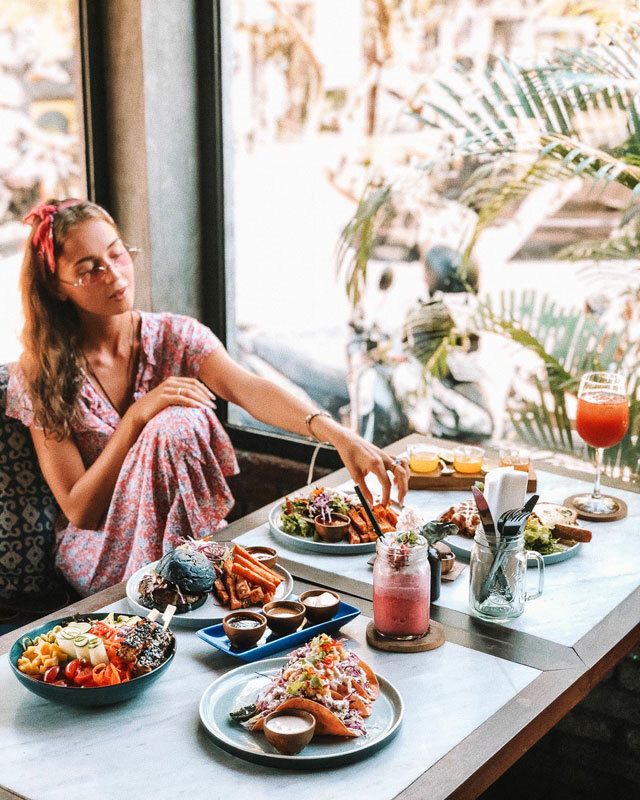 The menu is vast and many visitors find themselves coming here every day not just for breakfast in Ubud, but for lunch and dinner too! 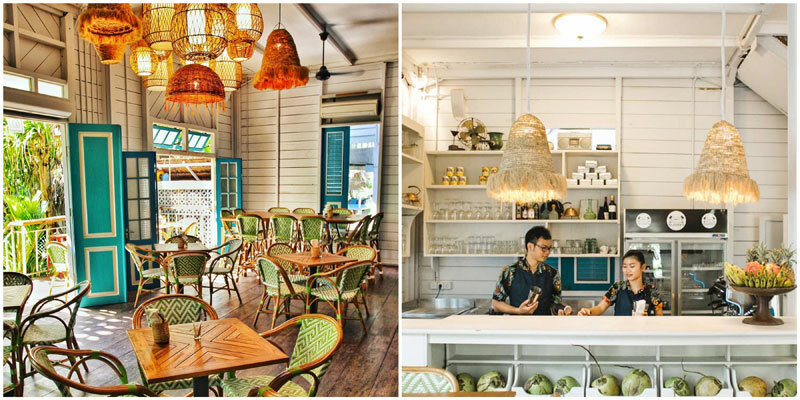 The cafe is owned by a local Balinese family who thinks of food very consciously. They have been supporting local farmers and growing their own produce over the past years so you can be sure that the nourishment and life behind each ingredient is carefully thought of! Getting there: Past Blanco Renaissance Museum after the Tjampuhan Hotel, head left and climb the Penestanan steps, right at the notice board, go past Intuitive Flow Yoga and you will arrive! 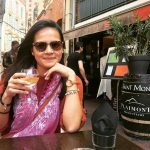 If you are looking for a perfect place to spend slow lazy mornings, Lazy Cats Cafe is the place for you. 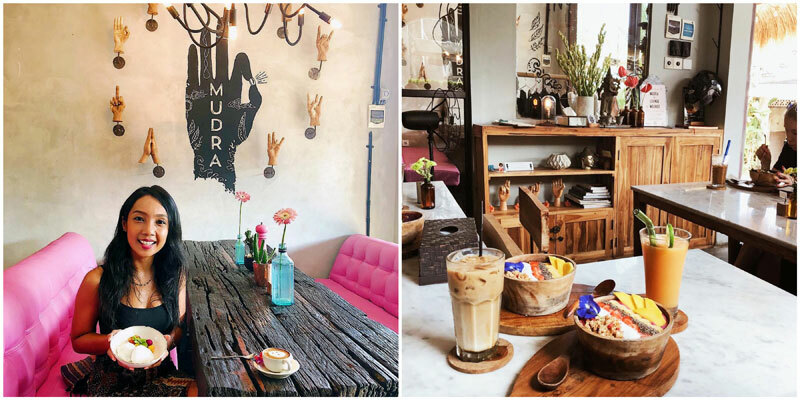 This cafe has a unique interior and vibrant food that will not break your wallet. Seat yourself on a comfy sofa on the first floor, which allows you to have a nice view. They offer unusual food variations – all vegetarian and beautifully served on a plate. You can be sure they pay attention to every little detail. Their carrot soup is out-of-this-world and the hummus wrap is also worth trying! And of course, who would miss the trendy furniture? The cat mirror simply purrs selfie, so don’t forget to take one! You must have seen it through your Instagram feed lately – smoothie bowls have replaced traditional big English breakfasts. 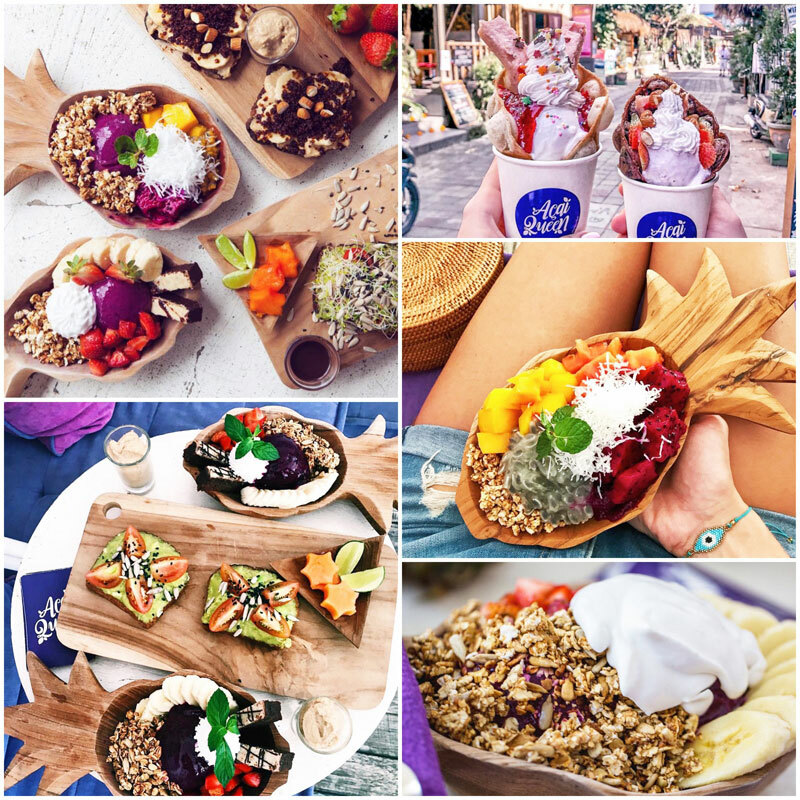 Simple and trendy, ‘the bowl’ is a worldwide hype that has taken Bali by storm and is the hot new way of getting your five fruits a day! 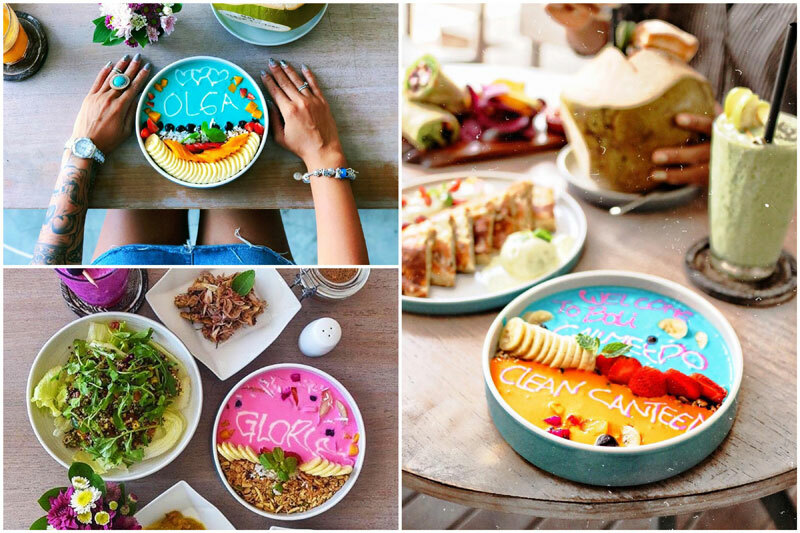 Clean Canteen does smoothie bowls that boast in colours – they are so pretty that you’ll think of it as a work of art; you are simply going to adore breakfast time at this cafe! 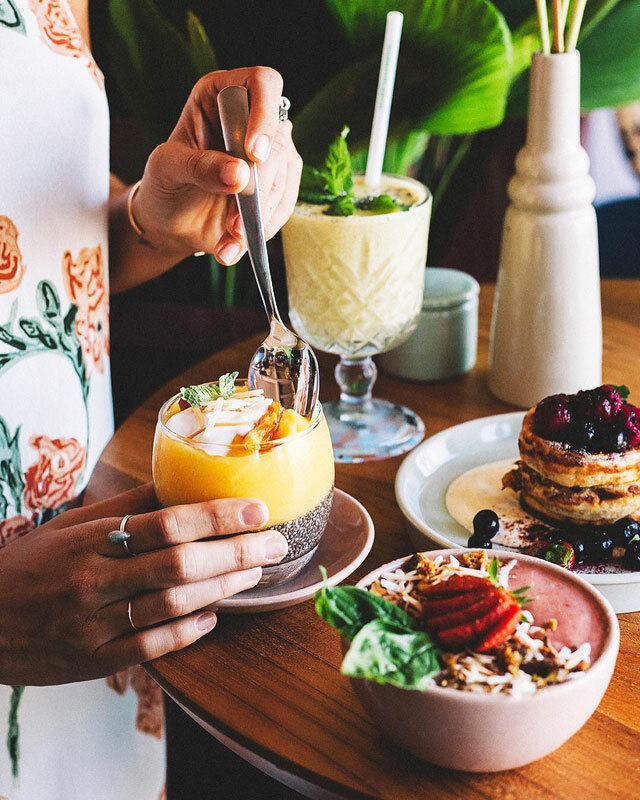 We would not even think twice if we had to choose between hotel breakfast buffets and smoothie bowls from Clean Canteen! You see, the cafe does not only give you smoothie bowls that taste delicious and look gorgeous but they give you both of these plus function. Your bowl is designed with fresh and healing ingredients bursting with summer flavours! Don’t feel like following the trend? 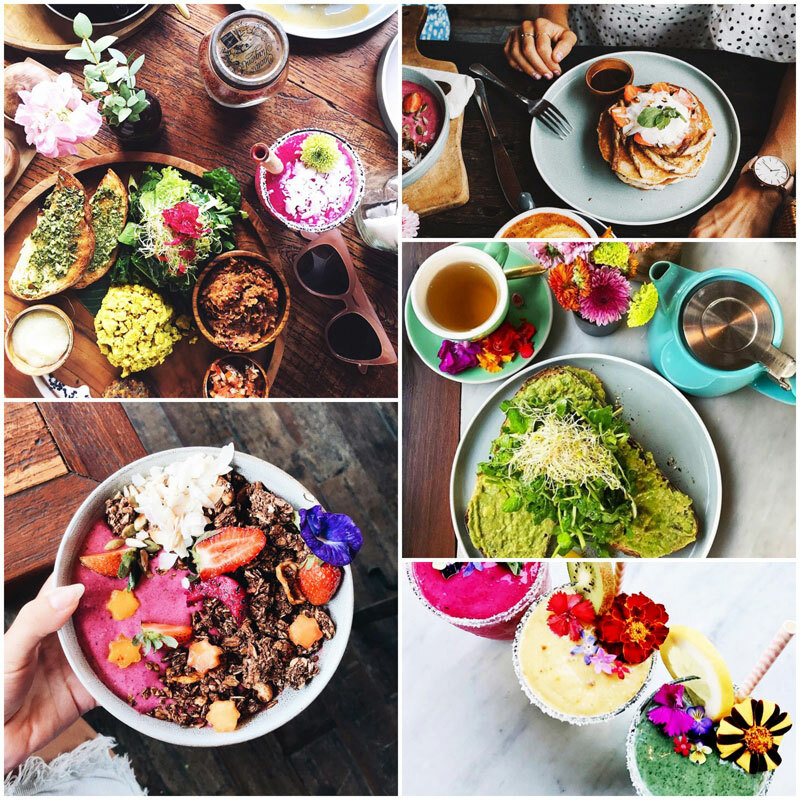 The breakfast menu at Clean Canteen is much more than just smoothie bowls! Other items to look out for are their ‘Egg and Smashed Avocado on organic German bread’ and Breakfast Veggie Wrap! These are apparently bound to impress your palate! Peloton Supershop is where Chicken Satay has been replaced by Tricken Satay, and Beef Rendang by Belief Redang. But let’s talk breakfast first! 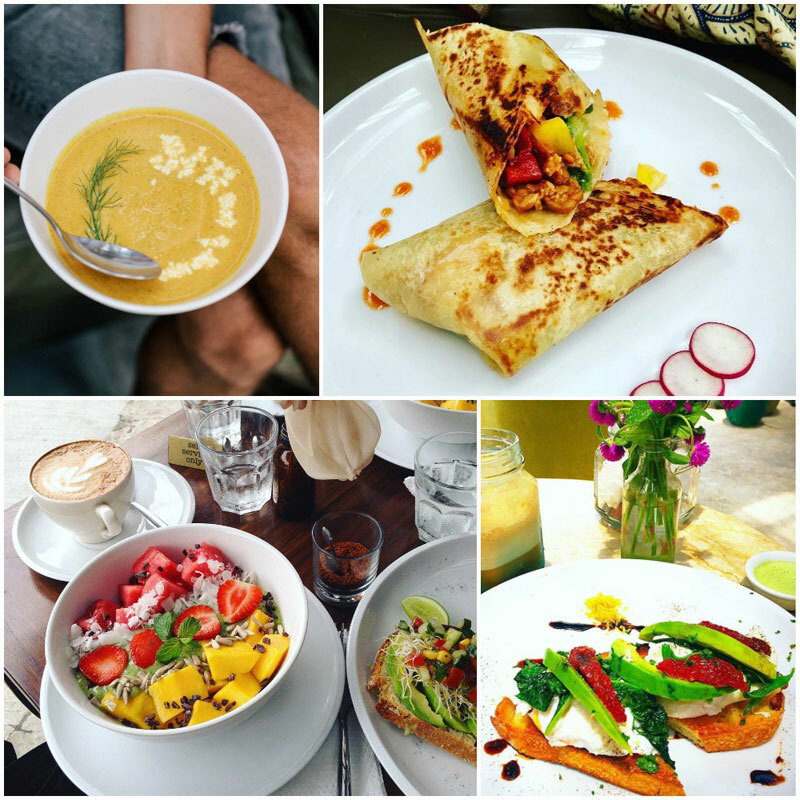 The cafe has been all over social media recently; it is showing up all over the food blogosphere of those who fancy clean eating and a conscious lifestyle. Truth be told, Peloton Supershop is all about minimal earth impact. 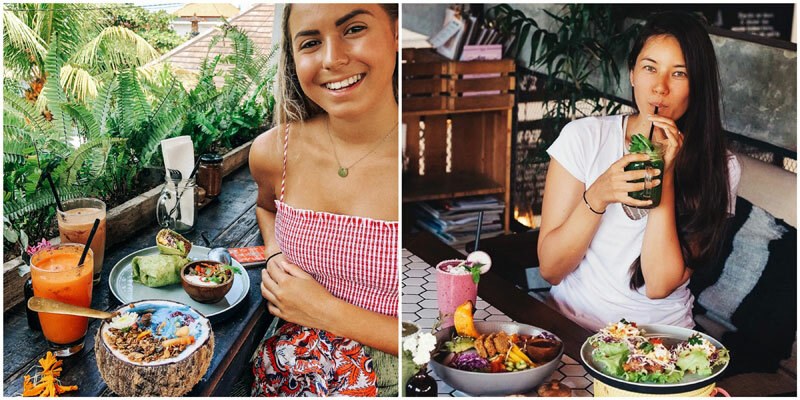 Break your fast with one of their morning selections – popular ones include their fully loaded breakfast board or their smoothie bowls adorned with edible flowers. Also keep some space for their cinnamon spiced pancakes layered with coconut whip and nectar, served with fresh strawberries and sautéed banana. Best is to order different dishes from their breakfast menu and share among yourselves! They put so much passion and dedication in the taste and presentation of their dishes that they could turn anyone vegan! I mean, take a look at their menu and food items; surely these selections can make any skeptic gain a new appreciation for the delicious decadence vegan food can offer us! With a main purpose to bring people of all kinds together, Peloton Supershop welcomes everyone – vegans and non-vegans, people of different religions, backgrounds and with different beliefs. 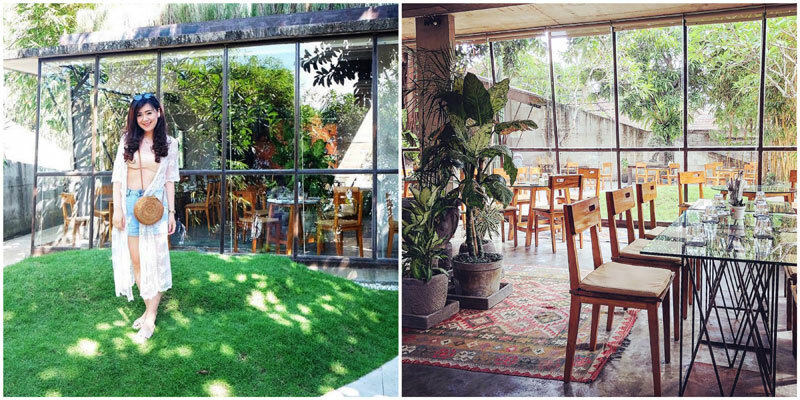 It is the ultimate open-space for everyone gather and share delicious and healthy food. 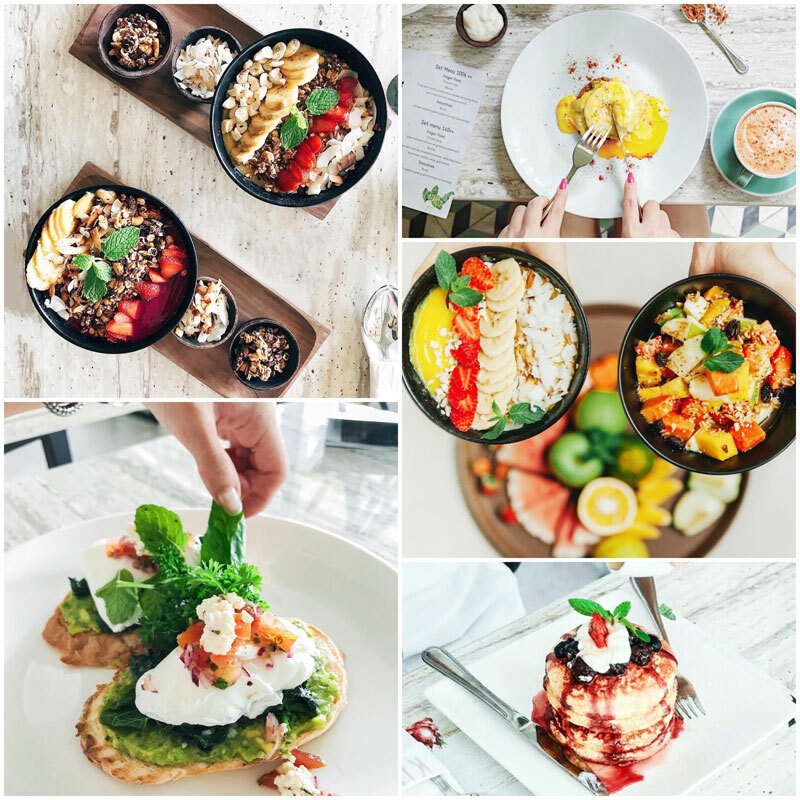 If you are the kind of person who wishes you could eat breakfast all day, this cafe is bound to amaze you with their all-day breakfast concept. Nebula Petitenget is no cafe to be taken lightly. 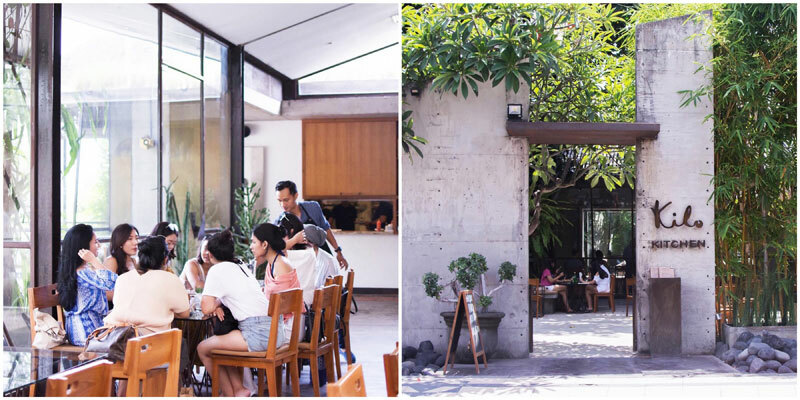 The cafe is dominated with minimalist decor and is renowned among locals and foreigners for its coffee, because according to Nebula Petitenget, “Bali is an island that deserves good coffee”! So, they took up the challenge and brought amazingly great coffee for you! When you are done with savoury, time for some sweetness in your life – get their Blueberry Pancakes that come in a stack ($3), where fluffy pancakes are piled on top of one another, with fresh berries, whipped butter and maple syrup drizzled around. 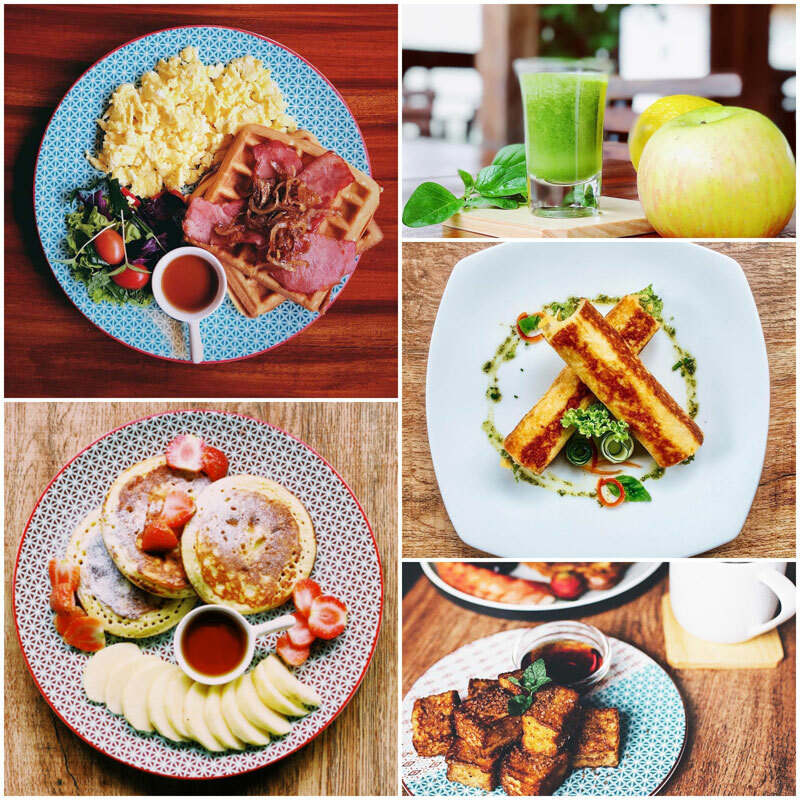 All their breakfast choices are wholesome goodness will leave you positively stuffed and extremely satisfied at the end of your visit! Come in at anytime, because breakfast doesn’t have to be limited to only one time of the day! 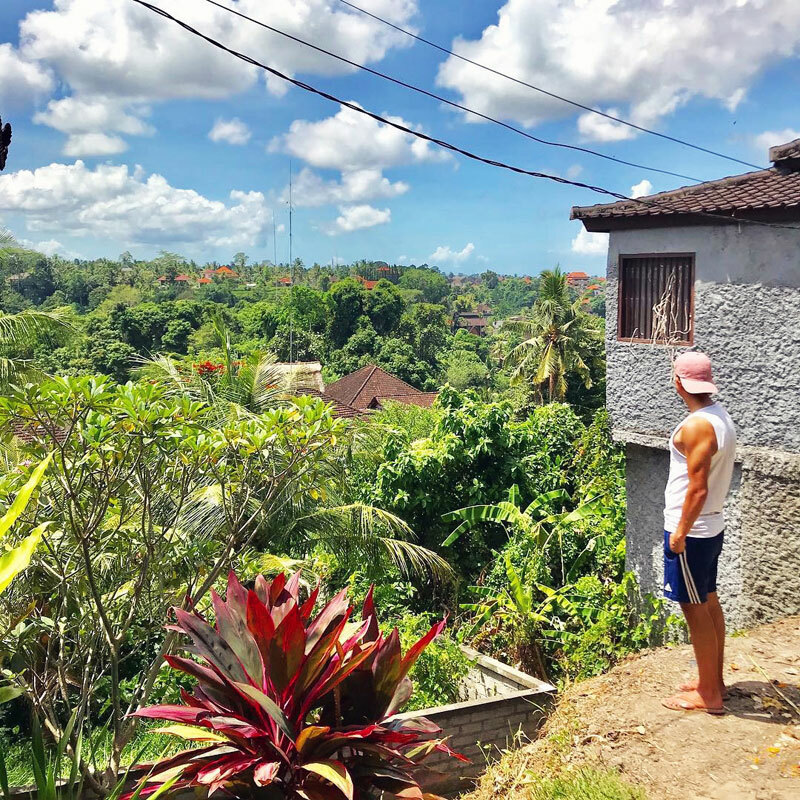 There are a few special reasons to love Ubud (the cultural hub of Bali). it is peaceful, spiritual and mystical on its own. 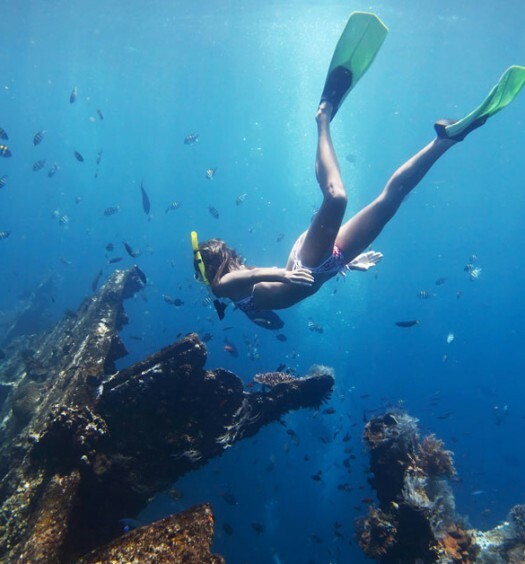 It’s just like time has stopped when you are hanging out there – where did all the rush of daily life go? 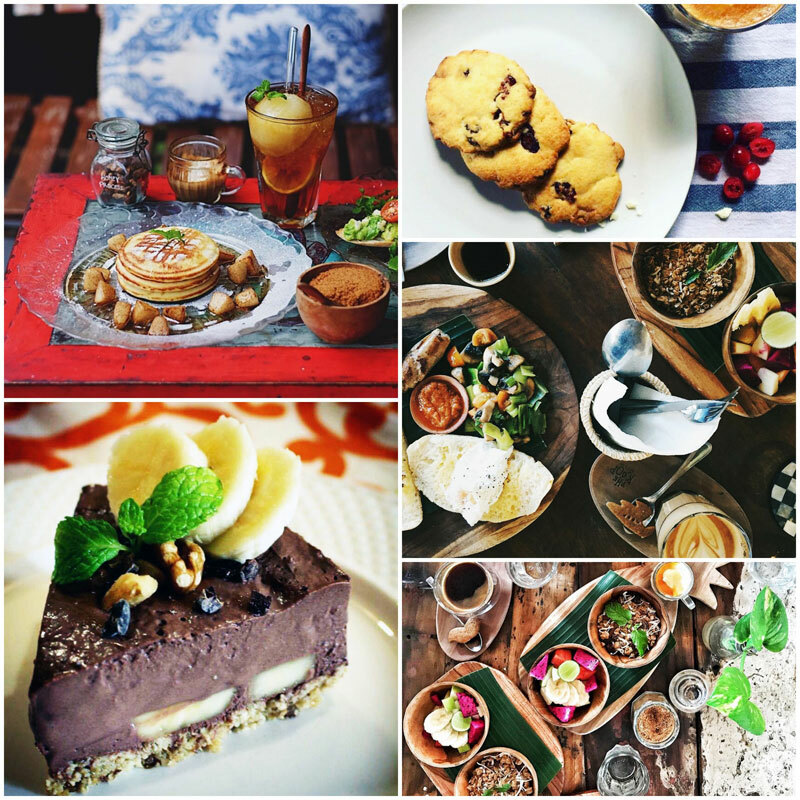 Thanks to cafes like Mudra Cafe for matching in the scene and letting you dream a little more while in Ubud, Mudra Cafe serves ayurvedic island food on the daily with every single ingredient sourced fresh from the nearby farm or ocean and built by hand; so each dish you order is curated to heal your body from head to toe! 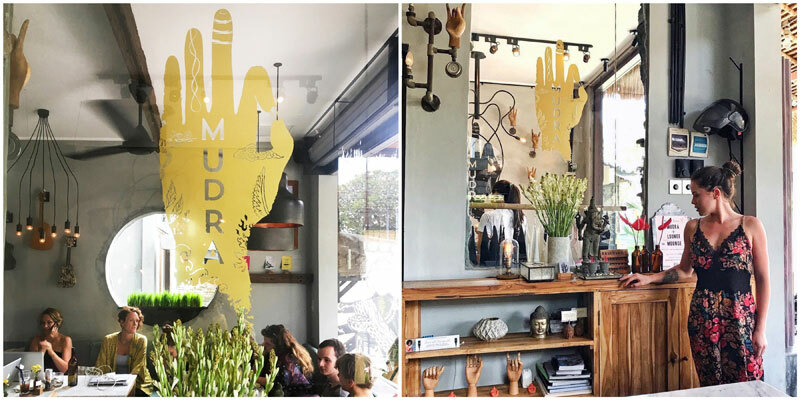 If you are a self-proclaimed foodie snob and pleasure seeker, you should definitely try out their Mudra Avogasm Toast (rated by many as one of the best avocado toast in Bali). Indulge in creamy chunks of fresh avocado, warm toasted ciabatta, nutmeg, sprouts, asparagus and secret French sauce, served along with an organic duck/chicken egg poached to perfection. 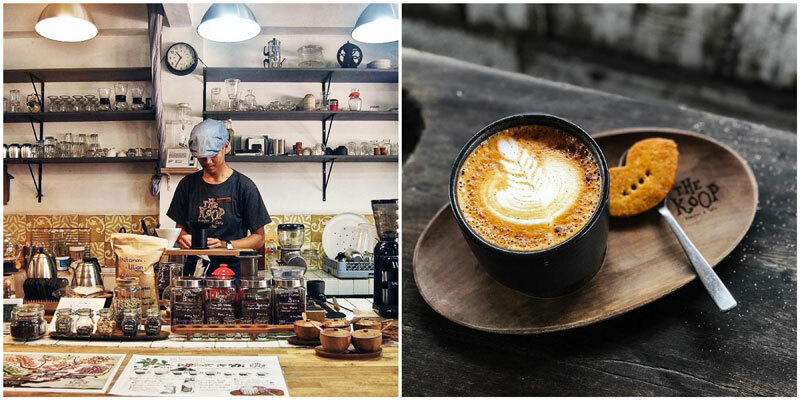 They surely deserve props for creativity and ambition in offering delicious coffee, tea and a healthy breakfast menu – just like a medicine for the heart and a mender to the soul! Recent years have seen a disappearance of typical eggs and bacon breakfasts. 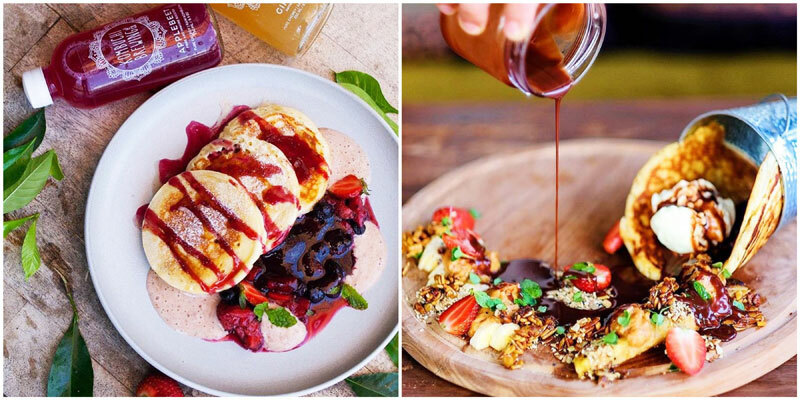 Cafes’ menus now boast bowl options and one of the most popular one is the Acai Bowl (pronounced as ah-sah-ee), also known as a superfood that has multiple health benefits. And of course you can expect millenials going crazy about it for its photo opportunities – “pictures or it didn’t happen” (but frankly speaking they are luscious-looking breakfasts!). 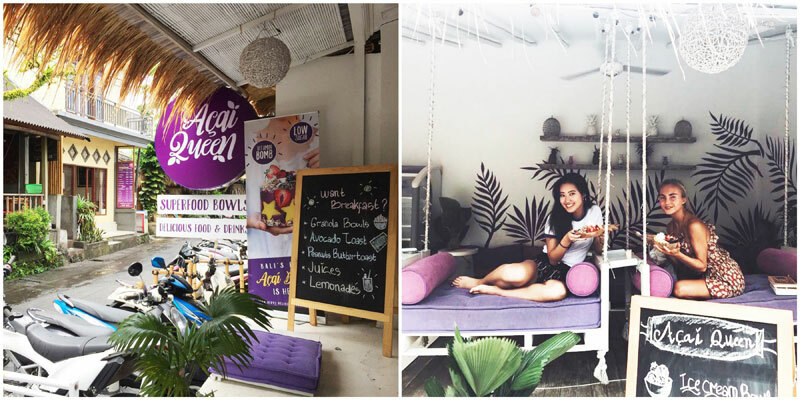 Right in the heart of Ubud, you will find a little shack with tropical decor (in acai colour) and whimsical swings… Acai Queen is known to master the art of acai bowl making, therefore queen of acai berries! Acai Queen is a bit like the Subway of Acai bowls, just like for sandwiches, you get to choose what goes into your bowl. Any extras? Choose between oatmeal, fresh fruits, peanut butter, and much more before you settle to wolf it down with a spoon! It’s a win-win situation as after eating a bowl, you will not only feel happily full (for hours) but you’ll also have done something good for your body. P.S. 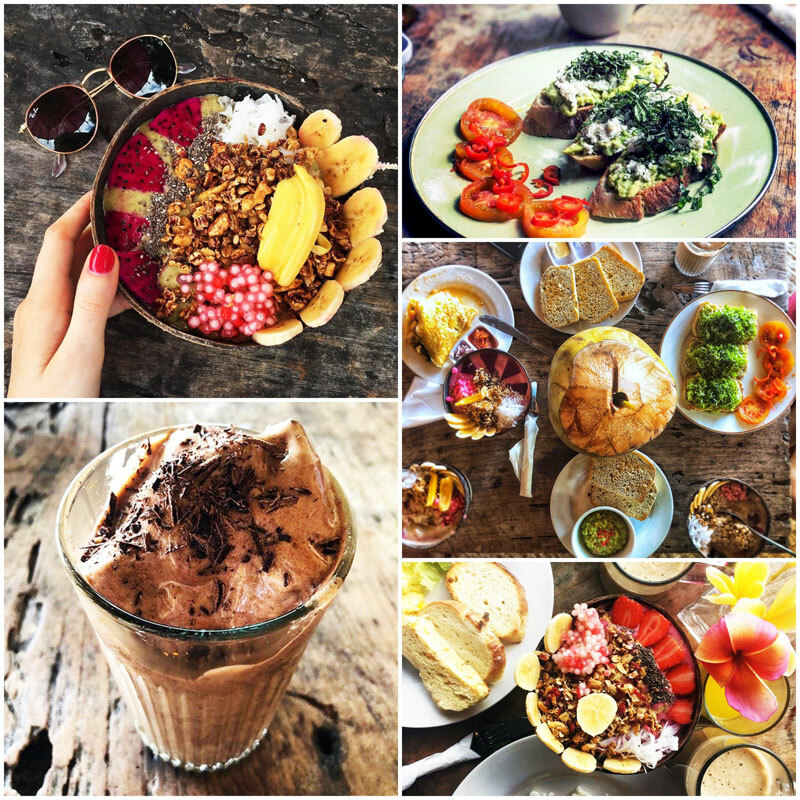 In case you haven’t come across a breakfast bowl before, just peek at Instagram where more than 290,000 posts are tagged as #breakfastbowl. Coincidentally (or not) the picture will also be tagged as #rawfood #cleaneating and #superfood. Just saying! The Koop Roaster & Coffee helps you get that much needed energy boost in the morning. Despite stiff competition, the cafe stands out for its quality beans and innovative brews that are as dark as night and as sweet as sin! 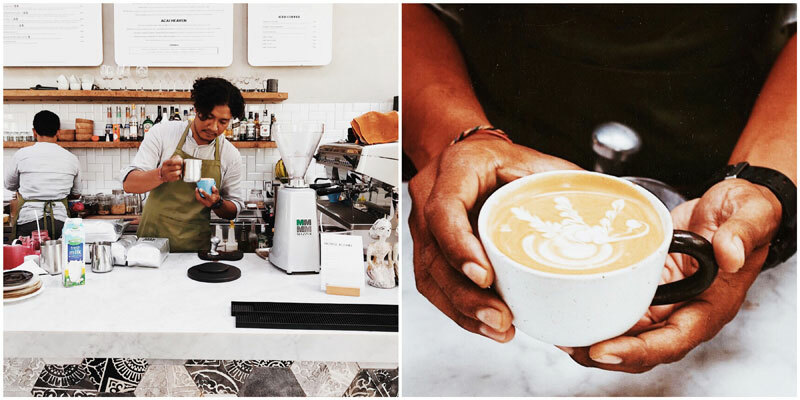 Right in Seminyak, step in the cafe and be welcomed by The Koop’s signature staff – all smiles on hand to serve you with your morning delight. 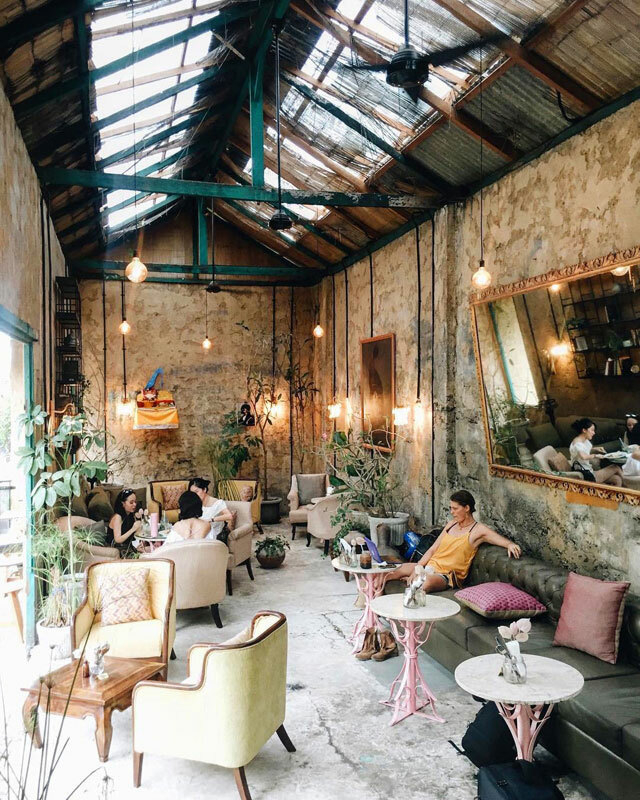 As well as offering a cool, rustic space to kick back in, there are plenty of coffees to choose from, and brewing methods to ogle over. Wondering what goes best with your morning coffee? 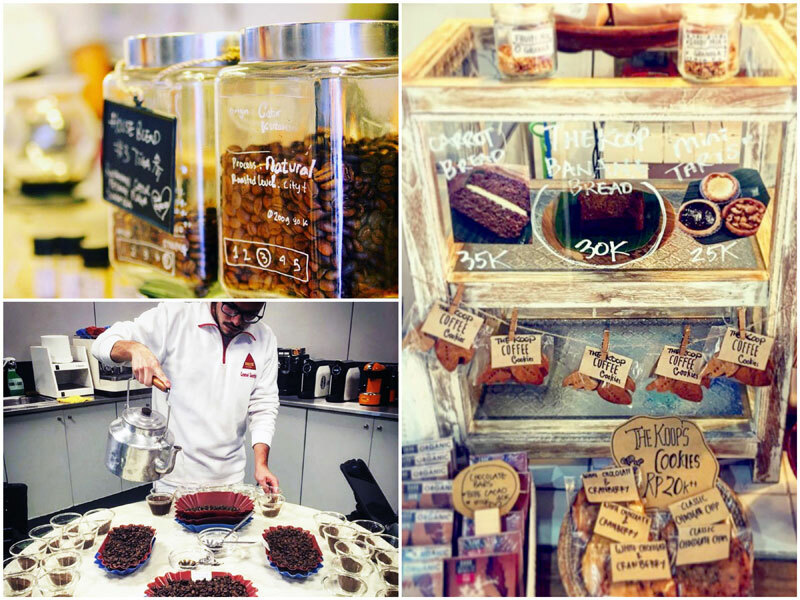 Grab their all-natural homemade bakes – they have delicious homemade banana bread, cinnamon rolls, breakfast bread rolls, classic chocolate chip cookies, lemon tarts, chocolate tarts and cashew nuts tarts. Interestingly, they also got the hang of making their own crunchy homemade granola that promises a very special heartwarming breakfast for you! 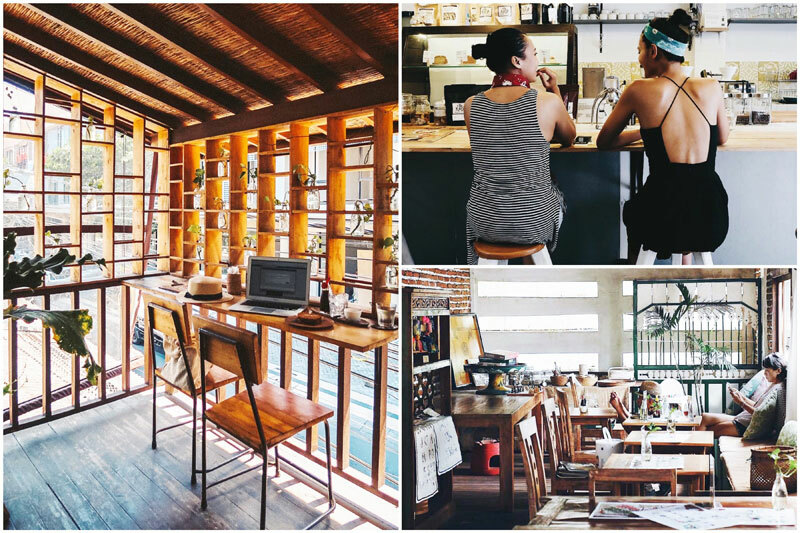 A must-try at the cafe is their authentic Bali Cold Brew. Far from your usual overly watery or overly bitter brew, this concoction guarantees strong coffee essence, mellow and sweet as well as low in acidity. Match this with the cafe’s breakfast platter, nicely flipped omelette to perfection with slightly grilled veggies and warm bread… And end with some banana bread while you pack their cookies for your day out in Bali! 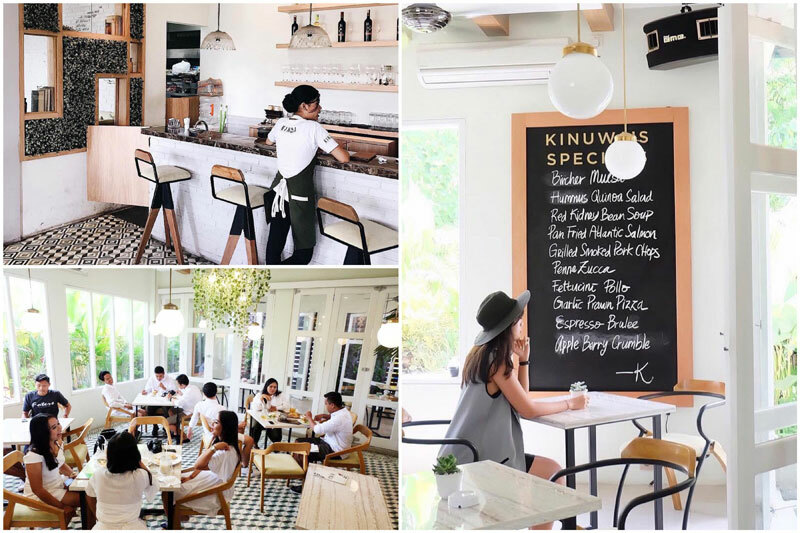 We are not surprised that the breakfast experience at Kinuwa is as chic as its interior. 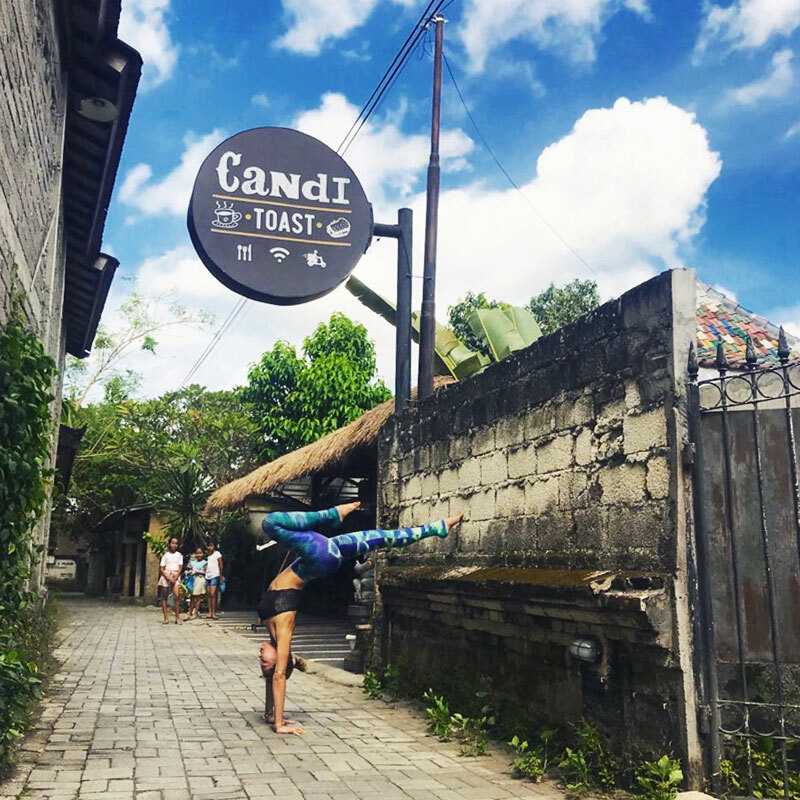 You can’t miss this spot while in the Gu and thanks to its strategic location, it is right between Jalan Raya Canggu and Batu Bolong Beach, also known as: “places where you will always hang out at”. Famous for its breakfast selections, mornings at the cafe bring a power breakfast of granola with fresh strawberries and other tropical fruits in milk, steaming hot coffee, eggs poached to perfection, crispy bacon, tangy baked beans, crusty grilled toast slices, and everyone’s favourite – light fluffy blueberry pancakes topped oozy maple syrup. Convinced yet? 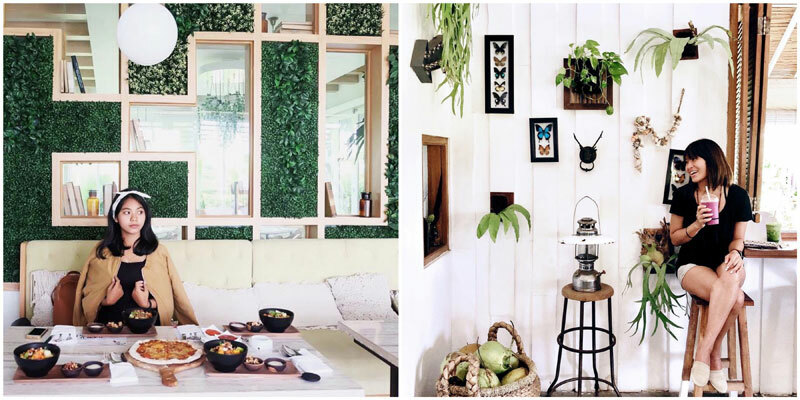 Kinuwa Restaurant & Healthy Bar does good food in a great interior, the spot attracts many for its Scandinavian decor – clean and minimalist, light and airy while being contemporary on furnishings. 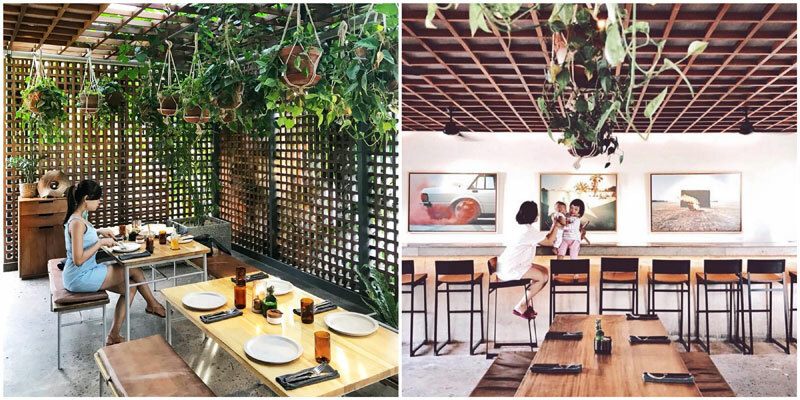 Their little touch of cozy and chic brings an instant breeze to Bali’s usual heat while they serve fresh and seasonal food to cool you down. If you’re hankering after a superb and authentic breakfast, you’ve come to the right place. Choose from the limited selections that guarantee well curated meals while seated on high stools by the healthy bar! Yum! The Savage Kitchen has come to Bali with a mission to shaping the very definition of the pre-midday meal. At the cafe, ingredients used in the kitchen are regionally sourced from local growers – you know, the fresh good stuff that Mother Nature has to offer! 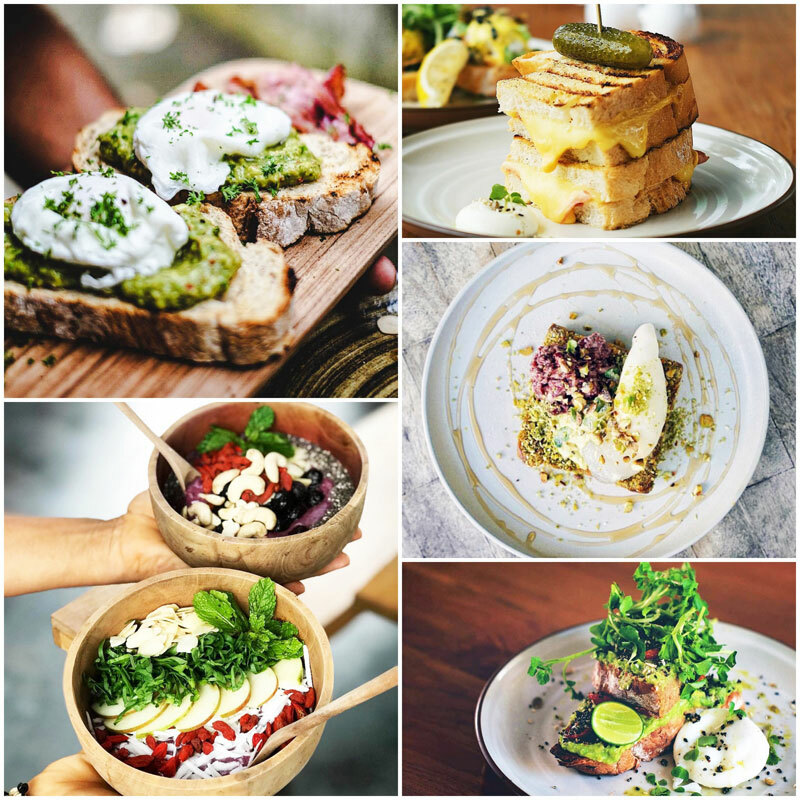 If you like your breakfast plain and classic, this isn’t the spot for you – the avo toast comes with labneh cheese, watercress and lemon but what makes this cafe great is their Breakfast Combo where you can literally create your own breakfast plate. More ham and less asparagus? It’s all up to you! Since all dishes made at The Savage Kitchen are fresh and à la minute, the cafe welcomes you to share about any dietary need you have! 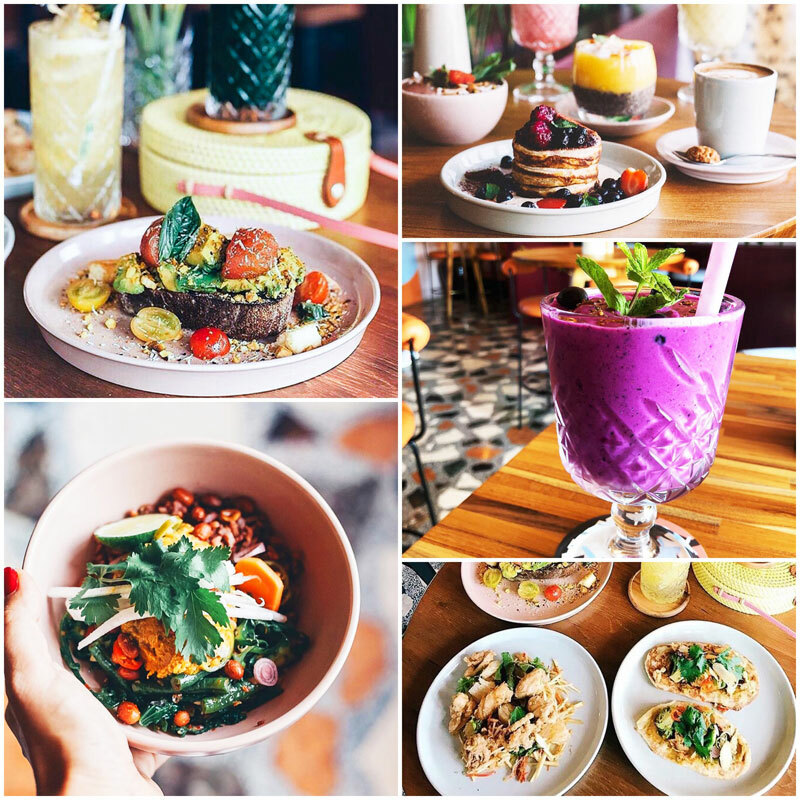 Skip your smoothie bowl today (although they do it great), get a little adventurous at breakfast and try out other menu selections like their Chargrilled streaky bacon with eggs your way, sourdough, bbq sauce or our favorite – Smoked salmon bagel with rocket, herb crème fraîche and pickled onion (I opted out from the onions though!). The Savage Kitchen is the perfect place to go on mornings when you want to indulge a little but not feel guilty about it. The cafe is designed to make you feel like you’re in your lounge room, but you could never make breakfast this good at home! When things go wrong, don’t go with them, sit down, take breakfast at The Good Mantra and stop feeling overwhelmed! 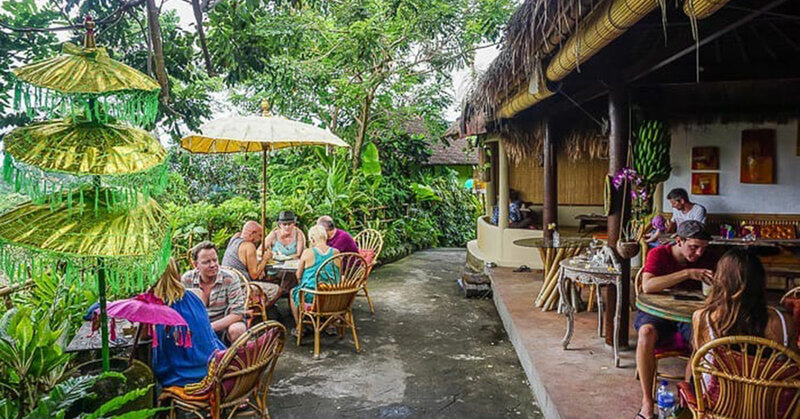 The cafe is located at Kosta Hostel and is known to be a retreat from the hustle and bustle of busy Seminyak. Come in early to secure a seat as the cafe gets crowded at breakfast time (don’t be fooled though, it is worth the wait!). Once there, you are welcomed with a taste of the tropics, the decor blends the beauty and tranquility of Balinese tradition with a breezy and bright contemporary space that feels miles from the busy streets. It’s time for you to sit down and unwind with their Tropical Island smoothie – a mixture of pineapple, mango, coconut milk and native honey. Smells and tastes the tropics! The breakfast menu boasts fresh fruits, granolas, mueslis and other favourites, including ours: The Biggy (a breakfast platter with everything you can ask for! ), and the Corn Fritter with poached egg accompanied by avocado slices, tomato salsa and sour cream is also GENIUS! 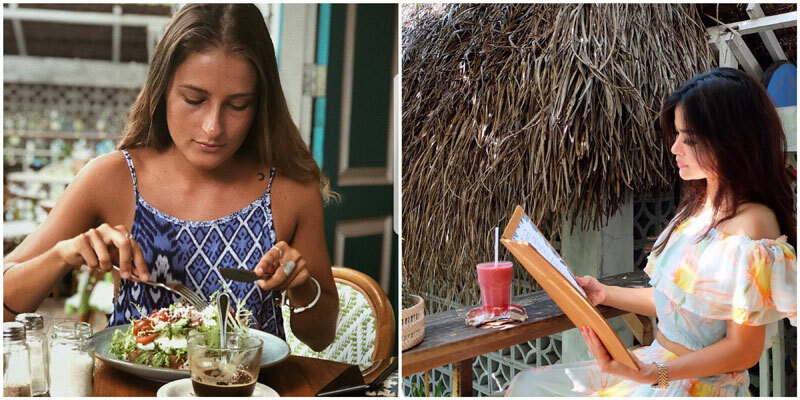 Your happy morning at The Good Mantra guarantees an excellent coffee in one hand and a spoonful of something delicious in the other but we repeat – be warned, the rest of Seminyak is already in on the secret so you may need to wait a little to secure a table in the morning! 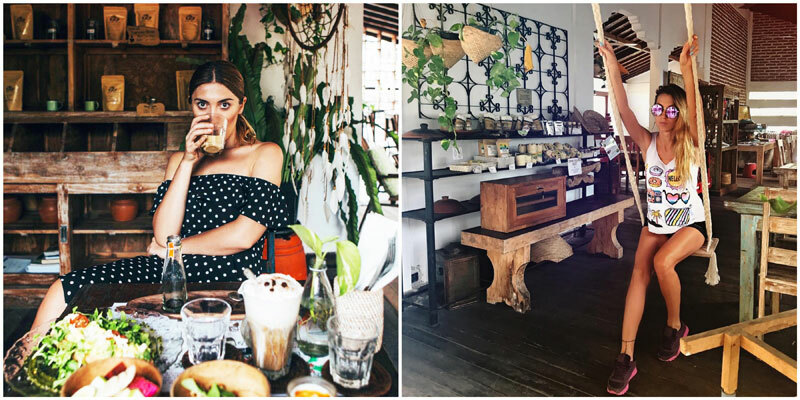 Many of those who have found about this cafe were initially on there way to Ubud Food Court, but they got caught to this little gem of a place, sat down for breakfast and instantly fell in love! 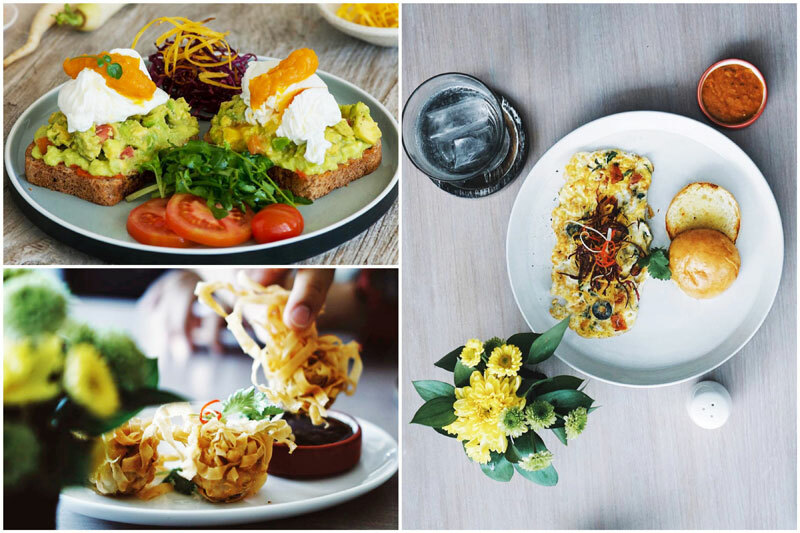 With super welcoming vibes from the staff, choose from their breakfast favourites like The Waffle Slammer – a combination of waffle with bacon and scrambled eggs along with a small salad on the side or simply opt for some Porky Avocado Toast – smashed avo on toast topped with crispy bacon and scrambled eggs as an extra; this surely gets our health-conscious tick of approval! End your breakfast with their holy fruit juices (great collection of fresh juices available)! 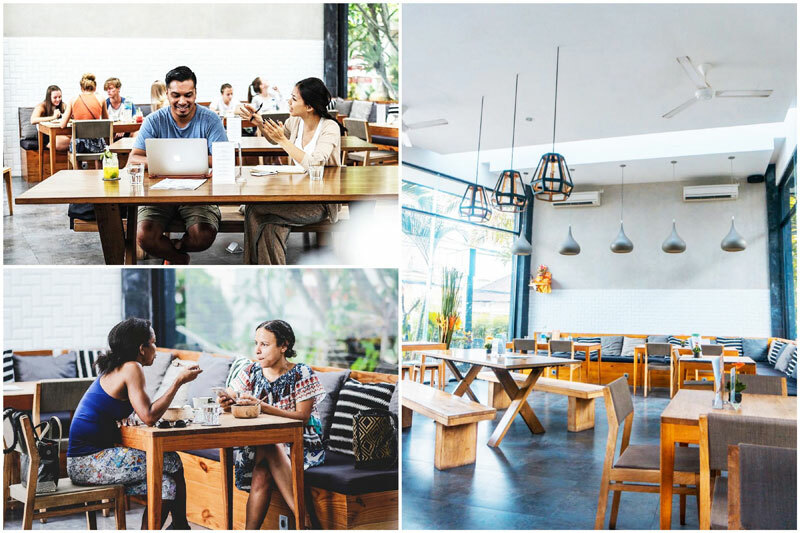 Your “no breakfast included” vacation is sorted out with this list of cafes in and around hotels in central Bali. 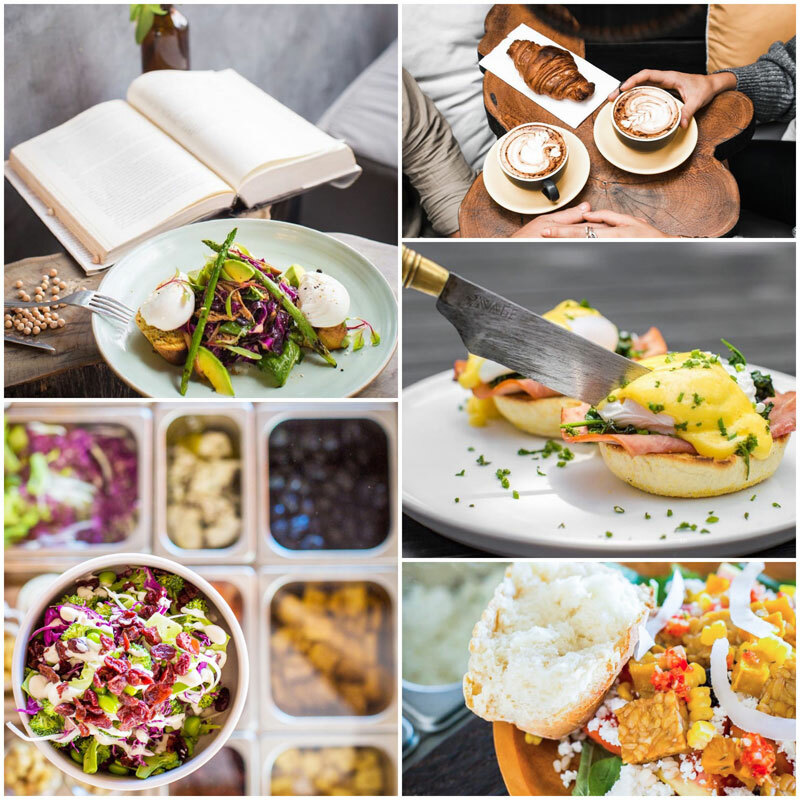 Tag your breakfast partner in the comment section below and let us know which cafe is your go-to breakkie spot!